I adapted this saucy little recipe from Canadian House and Home January edition. The original recipe was higher in sugar and fat. I made a few revisions to lower the carbs and after making the dish for the first time decided to replaced the wings for more meaty skinless drumsticks. 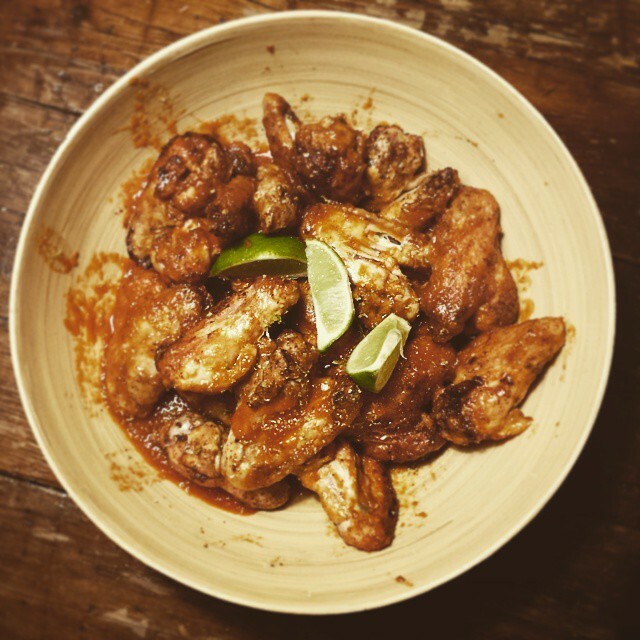 (hence the picture of wings not drums) I would also highly recommend to use our own Sugarless BBQ Sauce. I would suggest using your broiling pan or an oven proof cooling rack to bake the drumsticks on to allow the heat to circulate. To make the sauce pour the salsa, BBQ sauce, vinegar, agave and cumin in a blender. Puree till smooth then transfer to a small saucepan. Preheat the oven to 250F and line a large baking sheet or broiling pan with foil. Place broiling rack or cooling rack in pan and spray with oil. Place the chicken in a large bowl and pat dry with a paper towel. Toss with chili powder, baking powder, salt and pepper. Arrange chicken on racks and bake for 30 minutes. When chicken is almost done heat sauce over medium heat. When hot, add butter 1 tbsp at a time until emulsified. Place chicken in a large bowl and drizzle with the hot sauce. Mix until evenly coated. Sprinkle with lime zest and serve.